The KIT Telehealth Solutions modular platform can be adapted to suit the particular case. The image shows important components used in current reference applications. Due to the technical requirements, user support is crucial for long-term deployment of telemedical methods with active patient interaction. Although maximum user-friendliness, specifically for the older generation, was stipulated at the design and development stage, using the technology initially still represents something of a hurdle for certain patients. The KIT Telehealth Solutions platform supplies the technical help desk with the necessary information to provide prompt assistance and allows help desk activity to be recorded independently and separately from the medical data. An important goal of consistent use is to avoid complications and reduce the risk of secondary disease. Specific algorithms and sets of rules are applied to help doctors make the right decisions and choose the necessary interventions from the multitude of data available. These are based, amongst other things, on procedures described in medical guidelines. Prompt and efficient handling of general medical queries by a call centre as the first port of call is important for scaling. 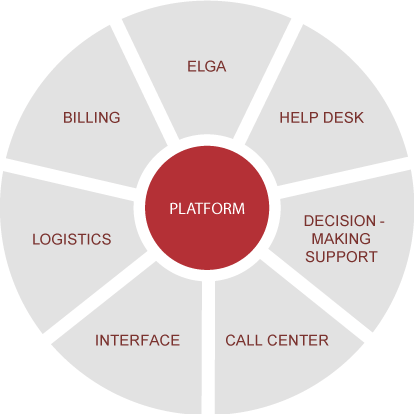 The flexible architecture offers a technical and organisational connection to KIT Telehealth Solutions and enables the contractual partner to choose the strategy for phase-dependent outsourcing (e.g. with an increasing number of users). Interoperability with existing information and communications technology (ICT) in the healthcare sector is an important factor in the successful use of telemonitoring solutions over the long term. When used for proof-of-concept, this criterion can be sacrificed in favour of flexibility and user benefit. For routine applications, however, the maximum level of technical integration must be achieved. This pays dividends through automatic data import, preventing duplicate entries, and consequently in higher quality data. The deployment of telemonitoring goes hand in hand with the use of measuring devices for recording vital parameters. In some cases the equipment used is issued out to patients. By supporting equipment logistics the administration and maintenance of medical measuring devices is supported in small, as well as larger, scaled operational scenarios. Using the system represents a new area of activity for the attending staff (doctors, therapists, nursing staff) to which they must devote a certain amount of time. Actual personal deployment depends largely on the usage scenario, medical indication and also the stage of the patient’s condition. If required, the platform can support users in listing activities (e.g. preparing feedback) as the basis for invoicing the relevant contractual partner. 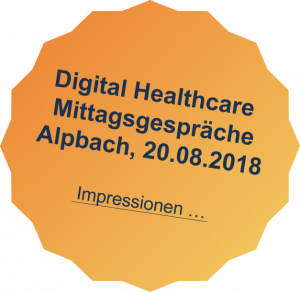 In the healthcare sector in Austria as well as other countries it is already possible, or will be in the foreseeable future, for health data to be shared electronically between institutions. Standardised document profiles in line with the HL7 standard for clinical document architecture (CDA) are used to integrate telemonitoring data seamlessly. Further simplification of telemedical support is anticipated, especially with the launch of the eMedication programme.